ЭКСКЛЮЗИВНАЯ ВИЛЛА С ЧАСТНЫМ ПОДОГРЕВАЕМОЙ БАССЕЙНОМ, ИГРОВОЙ КОМНАТЫ, JACUZZI, ОДИН ШАГ ОТ ЛУЧШИХ ПЛЯЖИ И ГОЛЬФ-КУРСОВ В МАЛАГА. СОВЕРШЕННО В ЛЮБОЕ ВРЕМЯ ГОДА !!!. 2 люди нашли этот отзыв полезным. An superb villa with excellent facilities required for a relaxing holiday. Juan was extremely helpful and available to sort out any minor issues that arose. Definitely one to come back to and will ideally suit both families with smaller children and/ or older parties. This is a stunning house and spotlessly clean. It looks good in the pictures but it is even better in reality. Both the inside and outside are spacious and were perfect for our family of 10. We all loved the pool, table tennis and pool table. A car is required but the location is convenient. The local town has everything you need and is a short drive away. Beyond that, there are numerous places to visit within a few miles with fantastic scenery in every direction. Juan Daniel was great to deal with. We would recomend this property and will seriously consider visiting again. 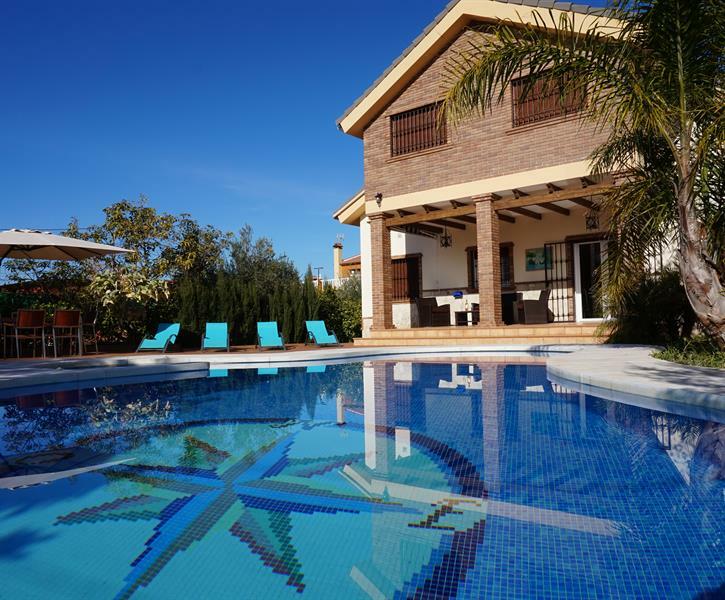 This house is in a stunning location- with spectacular views of Mijas' montain, the countryside and down to the sea. The gardens are really beautiful, dotted around are peaceful seating areas where you can sit quietly and take in the different views. Our family of 8 adults and 5 young children loved the heated pool with the jacuzzi. All the rooms were clean and tastefully decorated. It has easy access to Alhaurin el Grande with good supermarkets and lots on offer for young people. Booking was simple and Juan Daniel was easy to communicate with in English or Spanish! The house and gardens are loved and maintained by him and they were eager to help and ensure we enjoyed our holiday. We all agreed that we had a fabulous week- thank you.